Michael Peterlin and Son provides the highest quality workmanship at an affordable price. Family owned and operated since 1986, we continue to deliver quality workmanship, reliability and customer satisfaction at reasonable, affordable rates. Owners Michael and Stephen offer their expertise and experience to help you from start to finish with all your cabinet refinishing, painting and wallpapering needs. Our services begin with a free home estimate and are completed with customer satisfaction. We always strive to meet and exceed all of your expectations. Experience the difference with Michael Peterlin and Son! Be sure to visit us on facebook to see some past projects! 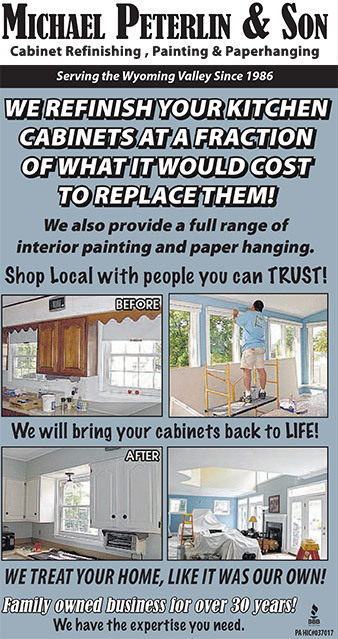 WE WILL BRING YOUR WOOD CABINETS BACK TO NEW! – Increase your Home’s Value. Preserve Your Valuable Woods. We specialize in decorative painting techniques for your ceilings to your trim. With more than 60 years of professional experience, we have the knowledge to tackle your largest, most involved paint and wallpaper projects with ease.